Welcome to the Blog section of the website. I will be writing about a few different issues that people use Counselling for and that I have extensive experience of working with. I hope to cover some of the main features of each issue, any helpful resources and interesting pointers. I am happy to discuss any of these further or if you would like to book a session to explore any of these issues further through Counselling please feel free to get in touch. Some of the issues I hope to cover in due course include Anxiety, Depression, Stress, Panic Attacks, Addiction, Relationship issues, Family difficulties, Work related issues, Personal Development, Identity, Bereavement, Loss, Grief, Self-harm, Low self-esteem, Confidence and Insecurity. Feedback and suggestions welcome. There is a lot of debate about whether depression is due to a chemical imbalance in the brain, genetic, things that happen in our lives, predisposed mood, lifestyle or a mixture of all of the above. It can also vary greatly in its severity and impact on day to day life. Some people may experience mild depression which could be similar to a constant low mood and some people experience severe depression which can lead to not being able to function day-to-day and may also lead to suicide. Having worked with Depression a great deal as a Counsellor, I have seen many different forms and heard a huge range of ways that people deal with and get through such a harrowing battle. For some people, the more that they have explored their depression, they have realised that it is actually the cause of low self-worth or self-esteem. If we really detest ourselves then understandably, our mood and outlook on life will be drastically impacted by this. Given time to unpick what the depression actually is and what underlies its presence, we then have some chance to see it for what it really is and begin to find a way through it. Alternatively, some people develop ways to deal with the day to day struggle of depression. This could just be setting yourself tasks such as getting out of bed, brushing your teeth, having breakfast, and then as you find your way through these, there can be a sense of achievement and progress. For many people, these may be everyday activities that do not get a second thought but for someone battling depression, leaving your bed in the morning can feel like climbing Mount Everest. Whatever your situation, I really do believe that there is a way through it. This may just be ways to find your way through each day, making life-changing decisions, taking some time to talk to someone else about your struggles or changing your lifestyle for the better. 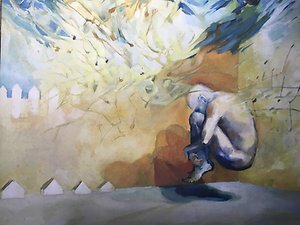 Mind give a great overview of depression, sources of help and other mental health issues. There is also a whole host of information out there to help inform you and help you on your road to understanding and recovery. If Counselling is not accessible for some reason then finding a friend or family member that you can confide in and talk to may be just as helpful. Equally, having time for and looking after yourself can be hugely beneficial. Overcoming such a debilitating illness can take time and be hard work but I have seen time and time again just how possible this can be with the right support. If you would like to ask any further questions about this post or any other issues then please feel free to get in touch. Along with Depression, Anxiety has been one of the most prominent and increasing conditions that I have dealt with over the last few years as a Counsellor. There are many suggestions as to why this may be the case; some say it is a result of modern life, others because of the lessening stigma of mental health and so more people talking about it or accessing treatment and a further suggestion may be a result of people holding too much, their buckets just too full with life and its many demands and challenges, resulting in anxiety, stress, panic. My personal experience, as a Therapist and also just in day to day life, has been a mixture of all of these things mentioned above. Our modern world demands so much of us and also gives us so much information, and at a breakneck speed. Social media is portraying images of perfect lives that we feel we have to live up to, but are completely unrealistic. This very apt quote from Action for Happiness seems to capture it so well: "So often we compare our insides to other people's outsides." Alongside this, we are flooded with products, images and advertising that promise to fill our deficits with very impermanent and unsubstantial things (can a can of coke really make me feel that happy?!) And all this is even before you begin to add the many challenges that life can throw up; relationship issues, bereavements, illness, finances, parenting, the list goes on and on. What this can often lead to is a feeling of being overwhelmed, inadequate, confused, unfulfilled and stressed. What I have experienced happen so frequently with clients is that they carry all these things around with them, making each day a struggle but also it can then just take one more thing to tip people over into panic attacks, breakdowns or just having enough of everything. This can also be paired with a feeling that we "should" be able to deal with all these things, that they are only little things that everyone else can deal with and feeling so weak and insignificant when we struggle with these "minor" issues. We might not even know why we are feeling the way that we are but are just aware of a uncomfortable, unsettling, difficult feeling that remains with us and can vary depending on our situation or state of mind. Anxiety can also often be a private battle saved for bed time routines, when we are alone, internal battles that we have with ourselves and that those around us may not be in the least bit aware of. Although sharing this with someone else is sometimes the last thing we want to do, the relief and impact of doing so can be huge. If we are lucky, we have friends that will understand and accept what we are going through and can offer you support through talking about it. Often, this may not be the case and can lead people to access Counselling and other support services. Knowing that you will be listened to with understanding and not be judged can be such a relief, especially when often we feel as though we are damaged, inadequate and going crazy. Sometimes people are unable to access services like this for a number of reasons (money, time, motivation, embarrassment etc) and so other resources are helpful. I have found the information and support available on www.panic-attacks.co.uk very useful. It is informative, free and helpful. As well as this, mindfulness or meditation has been repeatedly proven to reduce anxiety as well as offering many further benefits to everyday living. I have found that Headspace is a great introduction into meditation. It is free (to begin with), is very accessible, guides you the whole way and explains things in a very simple and clear way. Give it a try and you will have the basics to continue the practice without having to subscribe after 10 days! There are many further practices that are probably no surprise to see that help anxiety; exercise, good diet, being active and doing meaningful activities, spending time with others, doing things you enjoy, having purpose in life. However, sometimes there can be underlying issues which cause anxiety and so some people find that merely reading, practice and changing habits is not enough and a deeper exploration can be helpful. There really is a host of possible solutions but it is such a unique journey that only you will know what feels achievable amongst all these things and which things do and don't work for you. There is not one or the same fix for each person and anxiety is very much an individual journey that you need to find your way on (sometimes getting lost, sometimes needing help). If you feel that there is anything that you would like to add to this blog post, feedback or to discuss further then please feel free to get in touch.. I think its fair to say that we have all had some experience of loss or bereavement, whether that be a relationship, pet, friendship, death of a relative or friend or one of the many other types of loss we experience multiple times through our life. The experience can vary for each individual and is very unique, but there are some common emotions that usually feature at some point along the way. This could include shock, anger, sadness, guilt, denial, longing or grief, to name a few. 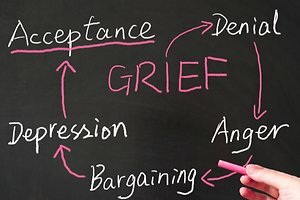 One of the most famous models around loss or bereavement is the Grief Cycle which was originally formulated by Elisabeth Kübler-Ross in her 1969 book On Death and Dying. 1) Denial & Isolation - This may be when we withdraw from others in first experiencing the current or eventual loss. We often deny that it is real or think things along the lines of "This can't really be happening to me." This is often seen as a defence mechanism to deal with the shock and pain of the first stages of grief. 2) Anger - We can then begin to experience anger. This may be directed at the person at the centre of the loss but it can also be directed at others, for example friends, family, the doctor who diagnosed the illness etc. Even if it we know it is not the persons fault for the loss, we can still feel angry towards them and as a result this can sometimes be hard to accept or express. 3) Bargaining - This can be where we try and avoid or prevent the loss. In a relationship it might be the equivalent to saying "I will change, we can make this work" or with death it could be thinking about "If only..." statement e.g. "If only we went to the doctors sooner" or similar. We may even bargain to God or a higher power that if we can prevent this loss we will do a certain thing or be a certain way. It is a way to avoid the inevitable or try and muster some hope in a hopeless situation. 4) Depression - This is where grief may enter our lives in a very deep and painful way. This is a natural reaction to the situation but can sometimes feel like we will never recover or find a way through. This stage can vary quite significantly in time span from weeks to years. Some may not even move on from this stage but if we are able to, then we will often find acceptance. 5) Acceptance - It is possible that we may not reach this stage in some situations. However, if we are able to, after moving through the 4 previous, difficult stages, this may be a time that we accept what has happened and feel calmer or more settled in ourselves. This does not necessarily mean forgetting or moving on from the other person, but it may be finding a way to live with the loss and continue with our lives. However, still with the inevitable times of sadness and pain. Loss is a very personal and varied experience. The stages outlined above are a brief guide but they are not guaranteed, always in order or exclusive. We may feel a whole host of other emotions related to loss and bereavement and that is just our personal journey. It can take a varied amount of time and we all deal with it very differently. Accessing Counselling or having someone to talk to can be a very helpful tool in this journey whether it be the loss of a pet, job, relationship, or loved one. We may even have very strong experiences of grief for people we don't like or have not treated us well in the past. It is all completely natural and part of the process, despite it being a very difficult journey. It can be very helpful to have support or someone we can talk to about our loss when we are experiencing it. However, many people feel that after a certain time, people are getting bored or don't want to hear about it anymore. This can be when we withdraw or keep our feelings to ourselves because we believe people aren't interested or they don't ask about our loss anymore. This may be a time that people access Counselling or other support service to help them through their journey or meet with people who are experiencing a similar issue. One thing that is certain, is that this process can be very difficult, emotional and hopeless. Unfortunately, it is hard for it to be any other way because loss is often a very testing and varied experience. We can feel fine one minute and be in floods of tears the next from an unexpected trigger or memory. What seems to work best for people is to be open to the process and emotions that they experience through loss, and try and fine the best way for themselves to travel through this. Whether that be talking to a close friend or professional, taking up a new hobby or being active, meditation, journalling etc. We have all experienced loss and millions have found their way through it so be kind to yourself through this difficult time and you will find your way. If you feel that you would like some further support through your journey of loss then please feel free to use the contact details throughout the website to get in touch and I will book you in as soon as possible.